THE PARTNER PROGRAM: INCREASE YOUR TURNOVER BY OPTIMIZING YOUR CUSTOMERS TIME! Our « Partner Program » targets all web agencies willing to offer their customers a smart and user friendly application that will improve their PrestaShop backoffice. Integrating tools onto your customers’ Prestashop interfaces making their daily store management easier will make you stand out from other web agencies. These tools will allow them to import/export their data and speed up input when creating new products. Conclusion, customers will save valuable time diving by 10 the time spent. Your customers will most certainly spread the word! A full Communication Kit (logos, colors, fonts, banners, product documentation) is available in addition to an editable Commercial Booklet for your customers, adaptable to all commercial strategies. Joining Store Commanders’ ‘Partner Program’ as a web agency, means that you can meet your customers’ needs by integrating made-to-measure tools. In return, guaranteeing your customers an appropriate and user friendly interface. 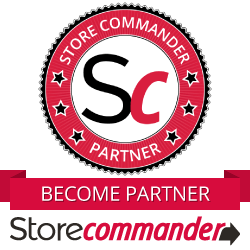 Increase your income and save your customers time by joining Store Commanders’ ‘Partner Program’ now and get a unique 20% discount code, available in your Partner space! MAKE MANAGEMENT SIMPLE. SAVE TIME. The range of applications developed by Store Commander extends PrestaShop features significantly, allowing you to focus on the interesting features rather than spending time on basic development. Please note that the following add-ons are complementary to Store Commander's module. CSV import / export custom fields management such as: Organic label, ERP reference, booking date, composition, etc... The possibilities are endless. Customizing your customers’ Prestashop to their business is good, but allowing them to edit data in bulk is better! This module allows you to check and fix over 50 different issues occurring in various tables of your Prestashop database!